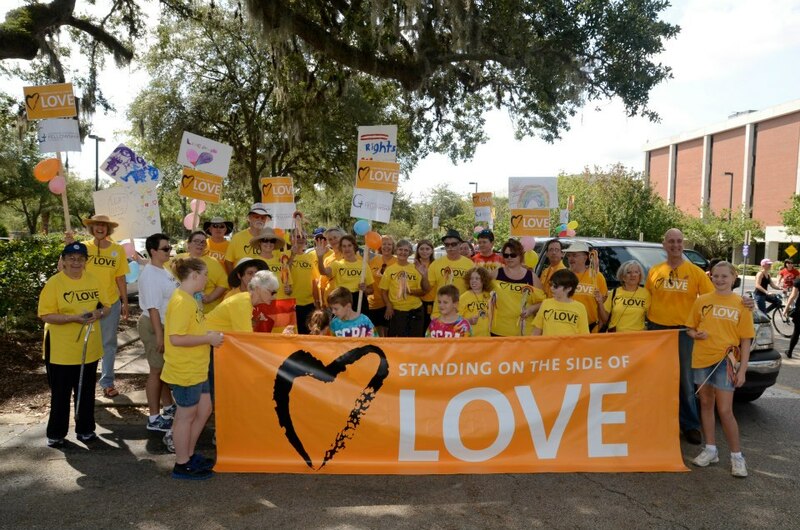 Yesterday, Lake Chalice began describing seven norms for love based in justice as advanced by Sister Margaret Farley: do no unjust harm, free consent, mutuality, equality, commitment, fruitfulness, and social justice. The old ideas of “the male as active and the female as passive, the woman as receptacle and the man as fulfiller” are violations of the mutuality principle. True relationship entails a context recognizing each partner’s activity and each partner’s receptivity -- each partner’s giving and each partner's receiving. “Two liberties meet, two bodies meet, two hearts come together” – and if they aren’t both bringing roughly equivalent levels of heart and self to the encounter, it isn’t mutual. Brief encounters are not ruled out, but even in brief encounters, let there be commitment to the preceeding principles, at least, and also commitment to be open to the possibility that the encounter may lead to long-term relationship. If there is no prospect of leading to long-term relationship, the brief sexual encounter is ethically suspect. The traditional norm is procreation. The procreation imperative comes from a deeper underlying principle of fruitfulness. We can now see that making babies is only one way to be fruitful. The relationship must not close in on itself. Love brings new life to those who love, and that new life is to be brought outward to the nourishing of other relationships. A relationship of just love strengthens the partners, and encourages them in their just work in the world. Thus is love fruitful and for the good of all. 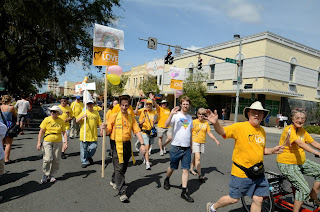 The ethic of Just Love requires not only that we bring certain principles to our own romantic and intimate relationships, but that we participate in making a society that honors and respects romantic and intimate relationships. Those seven principles – seven principles, where have heard of that? -- do no unjust harm, free consent, mutuality, equality, commitment, fruitfulness, and social justice -- offer acceptance and healing where the old sexual ethic so often wounded and repressed. 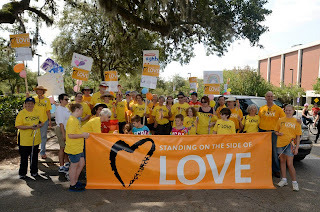 Standing on the side of love means also marching on the side of love, as many of the UUs of Gainesville did at the Pride Parade last Saturday (Sep 29). We wore our yellow shirts in support of LGBT acceptanace -- and a better understanding of the ethic that brings justice and love together. This is part 5 of 5 of "Just Love: Sexual Ethics Today"
Previous: Part 4: "Our Bodies Our Selves"